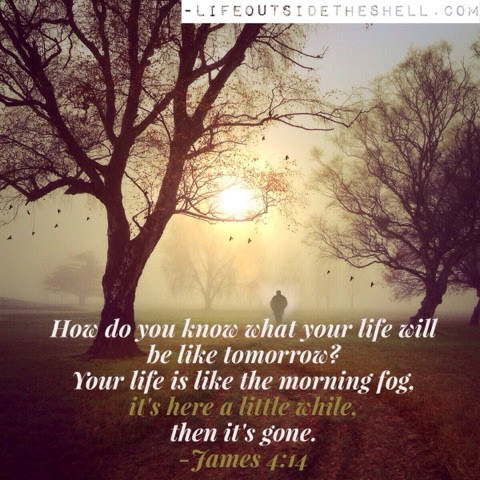 Life Outside the Shell: 4 Tips to live as if today was your last day! God has been speaking to me about the depth of this scripture from James 4:14. We have all heard the saying that life is short so make the most of every moment. But how many of us truly live this way? I know I don't. Yes, I have my moments but I fail to keep a kingdom perspective on a daily basis. The question that keeps coming to my mind is: what if today was your last day? The Bible makes it very clear that this earth is not our forever home. We are merely passing through until our day comes to meet our Lord and Savior We will take nothing with us. So why do we work so hard to make sure all of our earthly possessions are secured while taking very little time to think on eternal things? I believe it is because the enemy knows if he can get us to lose focus then he really doesn't have to worry about us having an impact on God's kingdom. I am convinced we should strive to live each day as though it is our last. According to this scripture in James we don't even know what our life will be like tomorrow. There is nothing wrong with making plans and filling our calendars but we must not be so obsessed with our plan that we miss God's plan. Matthew 6:34 says "So don't worry about tomorrow, for tomorrow will bring its own worries. Today's trouble is enough for today." This isn't to condemn us when we worry but instead to protect and enable us to live today to its fullest. When we focus on the things above, all the worries of this world(like what we will eat, drink, or wear) seem so small. I know if I was told today was my last day the last thing on my mind would be what outfit to wear or what is for dinner. Yes, God does care about the little details of our life, but He wants us to rest assured that He has got that all under control so we can focus on the things He has called us to. I can't write a post about living each day as though it is your last without challenging you to take a step of faith. If you knew today was your last, would you find the courage to call an old friend to make amends, share your testimony with a lost co-worker or friend, write that book, start that business, tell somone how much they mean to you, or start that blog you've been thinking of for years? Most of us would throw caution to the wind and just do it. While my motto and theme of this blog is to be bold and draw our strength from God, I never want to minimize the value of spending quality time with family and friends. Planning family time, vacations, lunch dates with girlfriends is just as, if not more, important than any major accomplishment we will have in life. If we accomplish all of our goals and dreams yet have no friends or family around to celebrate with us than we have lived an empty and sad life. We must prioritize and plan quality time with family and friends or it won't happen. God is asking me to dream big and do the things He has set before me. Will you join me in shifting our perspective to have a kingdom view and stopping living life for only ourselves but for God's kingdom? You never know how your action may light a fire in someone else's life. As for me, I will start by running my first Spartan tomorrow. Where I will go from there I do not know, but I know that I am following Jesus each step of the way and it continues to be the ride of a lifetime!